2/8: Stop by for a tour anytime! 3/8: Stop by for a tour anytime! 4/8: Our cheerful secure lobby is the heart of our school! 6/8: School buses with seat belts provide transportation to and from local elementary schools as well as to planned field trips. 7/8: We love our outdoor spaces! 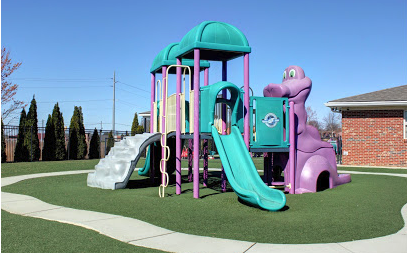 8/8: Our playgrounds are age appropriate, colorful and fun!